A policeman, a hotel director of sales, a marketing representative, and a utility employee: what do they all have in common? Each of them have participated in and graduated from a leadership program and have excelled in their field of occupation emerging as community leaders for the Lake Norman region. Huntersville Deputy Police Chief Michael Kee, Sally Ashworth – Executive Director of Visit Lake Norman, Tricia Sisson – Co-owner of The Range at Lake Norman, and Tim Holder, V.P. of Sales and Economic Development for EnergyUnited were recognized by their peers at a recent Leadership Lake Norman alumni event. Leadership Lake Norman is a program to develop a group of informed, committed, and qualified individuals capable of providing visionary and progressive leadership for the Lake Norman region. The program was developed and is administered by the Lake Norman Chamber with approximately 950 business members serving the Cornelius, Davidson, Huntersville, and greater Lake Norman region. Approximately 300 business leaders have graduated from the program since it was created in 1997. 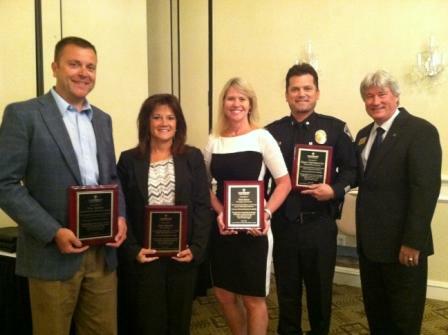 The four were recognized at the graduation of Leadership Lake Norman Class XVI (2012-2013) that was held at the Peninsula Club in Cornelius. Bill Russell, President and CEO of the Chamber, told a group of leadership graduates and alumni that eleven judges, composed of alumni and Chamber officers, examined the business careers and community impact of graduates from the first fifteen classes of the program. Russell said a recognition called the L.A.K E award representing “Leaders Achieving Key Endeavors” will be presented annually to Leadership alumni who have excelled in the field of: Municipal, Non-Profit, Business / Entrepreneur, and Corporate Leadership. While Tricia Sisson is a national account manager for the Clorox Sales Company, she and her husband Brian (also a Leadership graduate), and their partners Dave and Trish Stukbauer opened The Range at Lake Norman, the first woman owned gun range in North Carolina. Sisson also served as Chairman of the Board of the Lake Norman Charter School from 2010-2012. Tim Holder began the leadership program as a business development manager for EnergyUnited Electric Membership Corporation, and since has emerged as a dynamic leader in the economic development field. He represented the Chamber on a steering committee in 2003 which formed the Lake Norman Regional Economic Development Corporation (Serving as Chair for the first three years) and serves on the board of the N.C.EDC Association as well as the Mooresville-South Iredell Economic Development Corporation and the Lincoln County Economic Development Association. Applications and information for Leadership XVII will be made available via the Lake Norman Chamber’s website at www.lakenormanchamber.org. or by calling the Lake Norman Chamber of Commerce at 704-892-1922 mid June.